Why Does Windows 8 Want Me To "Trust This PC"? HTG Explains: Why Does Windows 8 Want Me To "Trust This PC"? 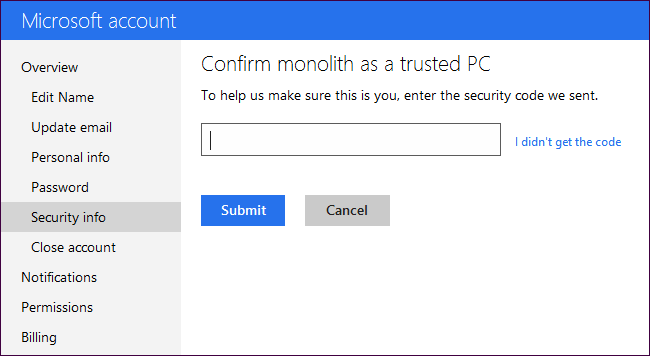 One of the first messages you’ll see after logging into Windows 8 for the first time (aside from a message about activating Windows) is a request to “Trust this PC.” But why does Microsoft want you to “trust” your PC? 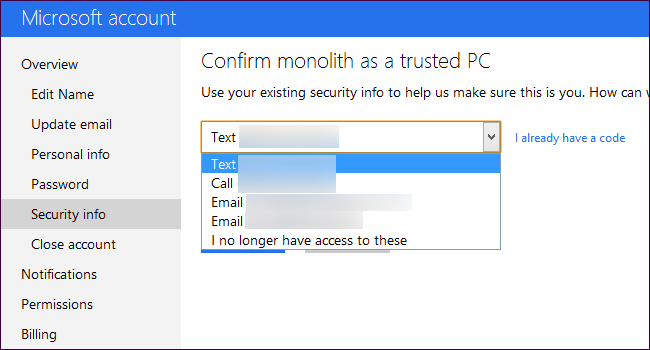 A trusted PC is a Microsoft account security feature. Only trusted PCs are allowed to synchronize passwords. You can also more easily reset your password from a trusted PC, should you ever forget it. You should only trust private PCs, not public PCs that other people have access to. If you share a PC with other people, anyone with access can reset your Microsoft account password from that PC. You can easily reset your Microsoft account’s password from a trusted PC. To do so, access the Microsoft Account password reset page from that PC. After entering your email address, you’ll be able to select Use my trusted PC to reset your password from a trusted PC. You won’t need access to your email or phone, just the PC itself. This feature may only work in Internet Explorer. Passwords stored with your Microsoft account will only sync to trusted PCs – even if someone is able to log into a Windows 8 PC with your Microsoft account, they won’t have access to your passwords unless they also have access to your account recovery email or phone number. 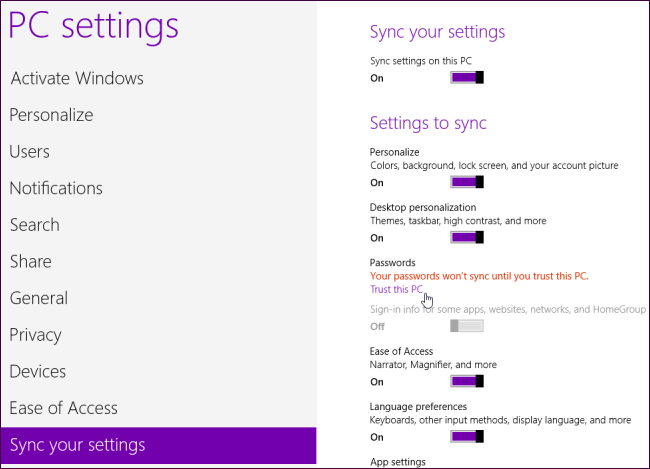 To control this setting, open the PC Settings app (click Change PC Settings in the Settings charm pane, you can select Sync your settings and enable password sync. To trust your PC after signing into Windows 8 for the first time, open the Action Center and click the Trust this PC link. You can also mouse over the bottom or top right corners of your screen, click the Settings charm, and select Change PC Settings. Click the Trust this PC link on the Users pane. 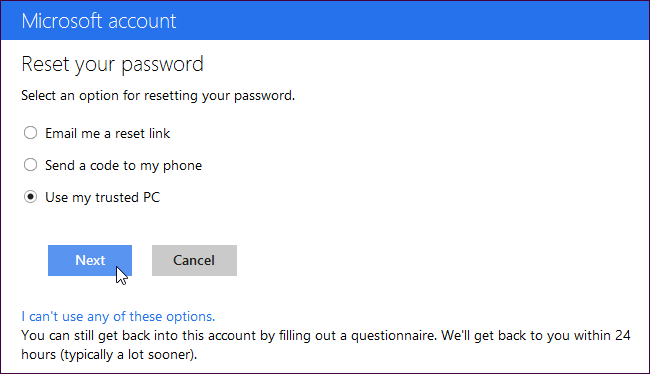 After logging in with the Microsoft account you’re using with Windows 8, you’ll be able to enter the security code Microsoft sent you. This code may be sent to your email address or your cell phone, depending on the recovery information you provided while setting up your Microsoft account. You can click the I didn’t get the code to have Microsoft send you the security code at an email or phone number of your choice. If you don’t have access to a cell phone, Microsoft can also call a landline phone instead of sending a text message. 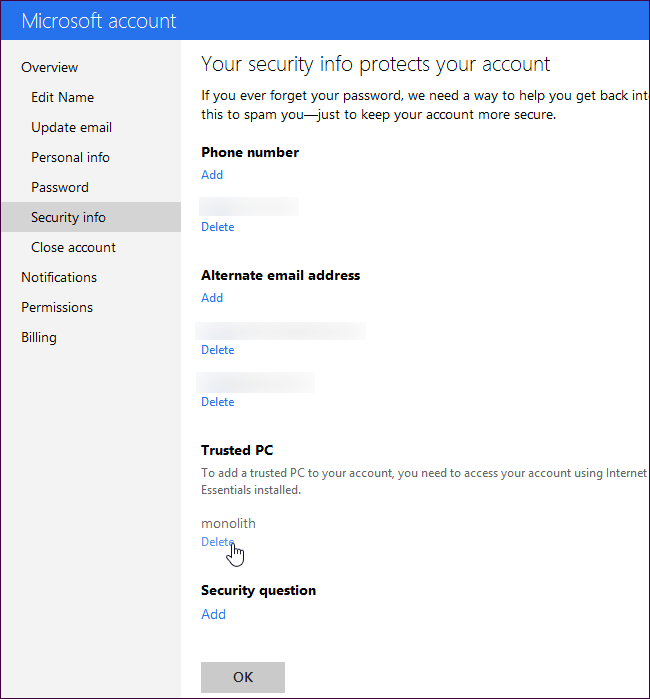 If you were emailed a security confirmation, you can also click the Confirm button in the email you received from the Microsoft account team. Click the button or enter the code and your computer will be confirmed as trusted for your Microsoft account. From the Security Info page on Microsoft’s account management website, you can view your trusted PCs and delete trusted PCs. You can also manage your phone numbers, alternate email addresses, and security questions from here.